Looking for a delicious homemade snack that will satisfy your cravings any time of day? These creamy peanut butter and coconut muffins, are slightly sweetened with honey and black Corinthian raisins, with some Lindt dark chocolate on top, which make them a perfect, healthy snack for your mid-morning or afternoon cravings. If you like them sweeter you can substitute honey with 1/4 to 1/2 tsp powdered stevia (or add them both, depending on how sweet you want them) and add some chocolate chips inside the batter instead of adding some melted chocolate on top. At the beginning of the New Year, I decided to go on a sugarless diet. Apart from cutting on the sugar, I am also following the principles of the Mediterranean Diet, as explained in my cookbook “More Than a Greek Salad”. Although I am not strictly on a diet, but just following a healthier lifestyle, I have already lost 4 kilos in 3 weeks. I decided to make these muffins with the leftover ingredients (peanut butter and cream cheese) I had from Dias’ Birthday Cake. Instead of adding flour, I used coconut which not only helped bind the ingredients but also added additional flavour. 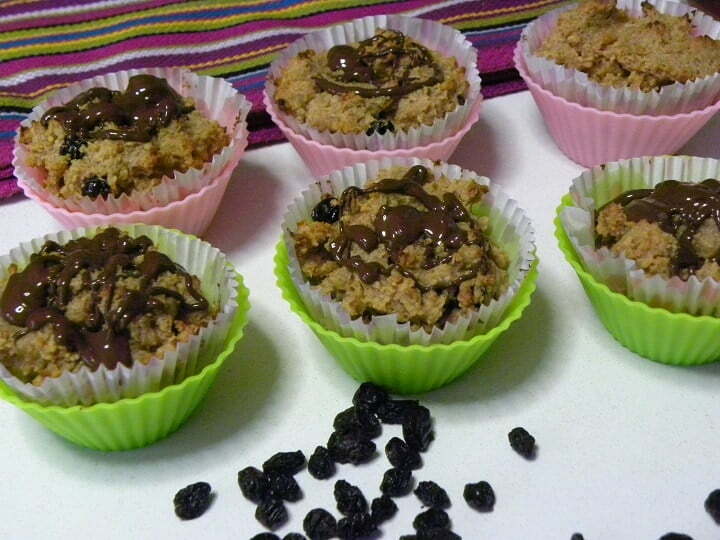 When making the muffins, as I did not have any stevia, I added the honey last, as I did not want any in mine. I removed enough for one muffin for myself and in the remaining I added the honey, for the rest of the family. I also did not add any chocolate on top of mine. If you make the recipe as shown below each muffin gives 250 calories whereas the ones without the honey and chocolate, only 200 calories. When making them again, I am going to powder the coconut to make coconut flour and add some baking soda or baking powder and see if they react like when using wheat flour. I will update the recipe when I do. Line your muffin tins with paper or silicon muffin cups. Beat the peanut butter, cream cheese and egg with a hand mixer until combined. Add vanilla and coconut and beat until smooth. Stir in raisins and honey. Bake for 18 to 20 minutes or until a wooden pick inserted in the center comes out clean. Remove on wire racks to cool. Meantime, melt the chocolate in the microwave, testing it every one minute until it has completely melted. Remove from the microwave and mix in butter until it is incorporated. Using the spoon drop some of the melted chocolate on top. I love healthy yet delicious sweets like this, Ivy. Peanut butter and coconut are both my favourites.